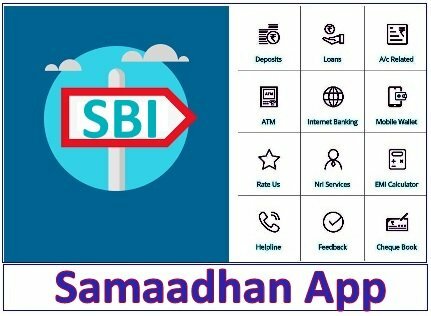 SBI Samaadhan App is a mobile application developed for the main purpose of serving State Bank of India (SBI) customers. This mobile app makes it possible for SBI customers to fully access all the services offered by the bank without necessarily having to avail themselves in the bank. From the moment you access the app, it is possible to access quite a number of services through the click of your smartphone. In this post, we will have an insight on how to register on SBI app and also look at the features and facilities that this app has. With this app, it is possible for a customer to call a given SBI branch manager or controller when faced with an issue that needs urgent assistance. A user can also get the chance of asking any question for the purpose of clarification. The manager will then give the customer feedback once the request is received. When having a complaint, this app allows you the chance of raising it to the bank. It also allows a user the opportunity of closely monitoring the status of resolution of the raised complaint. It is possible to get the SBI Account Statement for the last six months by simply downloading it from the app. The statement is then shared using a user’s personal email account that was registered with the bank when opening a new bank account. For a person who has an existing loan whether Housing Loan or Educational Loan it is very easy to generate the certificate by downloading it from the app. The certificate is eventually transferred to the email address registered with the bank. Frequently Asked Questions (FAQs) that may include mobile banking, mobile wallet, advances, and deposits are found in the Samaadhan App. This is important in helping the user get information on services that are offered by the bank. This application is only available to users that have a smartphone that is Android or iOS enabled. For a person who has an android mobile phone, the app is available on Google Play store and for iPhone users, it is downloaded from App Store. Loans: Different types of loans such as an Educational loan, Car loan and Home loan can be accessed from the app. Deposits: Different types of deposits are available ranging from Recurring Deposit, Savings Account, Maturity Amount and Term Deposit. Account related: Checking on the status of an existing loan is also possible when using the SBI Samaadhan app. The account statement can also be easily retrieved from the application. ATM: Frequently Asked Questions, video, and share is available in this option. Mobile Wallet: Include information such as Videos, share, SB Buddy and FAQs. Feedback: This makes it possible for a user to raise any complaint and follow up as it is being solved. Cheque Book. This App has the capability of only giving you Multicity Cheques on your request. Rate Us: From this option, a customer is able to rate the experience they had with the staff when requesting for a given service. Helpline: When a user wants to contact the bank, this facility comes in handy as it contains the Toll-free and Branch Helpline. Internet Banking: With this SBI Samaadhan App, a customer can enjoy the advantages of technological advancements in mobile banking. This is available as Corporate INB, Retail INB and SBI Anywhere Personal. NRI Services: Available in this facility are options like Loans, Remittance, Help Centre, Investment, Deposit Product and FAQs. Miscellaneous: This facility covers small issues that may not be closely related to State Bank of India. They may include your Holiday Calendar, SBI Quick, SBI Finder and Downloads. The following guidelines will make it possible for you to easily use the SBI Samaadhan App. Open Google Play Store and look for SBI Samaadhan App. Click on download and start downloading the app from the Google Play Store. Once completed, install the App into your smartphone. After the App is successfully installed in your smartphone, open it and choose the service you want to use by clicking on it. After successful installation and an an opening of a service in the App, it becomes ready for use. From your smartphone, open the installed SBI Samaadhan App. On the home screen of the app, click on “cheque book” to start the application process. On the page that follows, submit your cheque book request by clicking on “Yes”. Submit all the details in order for you to register the device with State Bank of India. Once registration is complete, the request for your SBI cheque book will be processed by the bank. Once it is processed, the bank will issue you with 2 leaves for every cheque book. The bank will deliver the cheque book to the address that you issued to the bank when opening an account. You can then pick the cheque book from this location. It should be noted that the State Bank of India only issues multicity cheques once requested from your SBI App. When it comes to requesting a normal cheque book, the App does not make it possible and hence it is required that you contact your SBI home branch.